In this tutorial, you'll see how to get started with setting up and using a fake REST API server using json-server, which you can use while developing mobile or web applications. This tutorial assumes that you have a basic knowledge of JSON and HTTP requests. REST stands for Representational State Transfer. It is an architecture style for designing connected applications. It uses simple HTTP to make communication between machines possible. So, instead of using a URL for manipulating some user information, REST sends an HTTP request like GET, POST, DELETE, etc. to a URL to manipulate data. For example, instead of making a GET request to a URL like /deleteuser?id=10, the request would be like DELETE /user/10. Why Do We Need a Fake REST API? 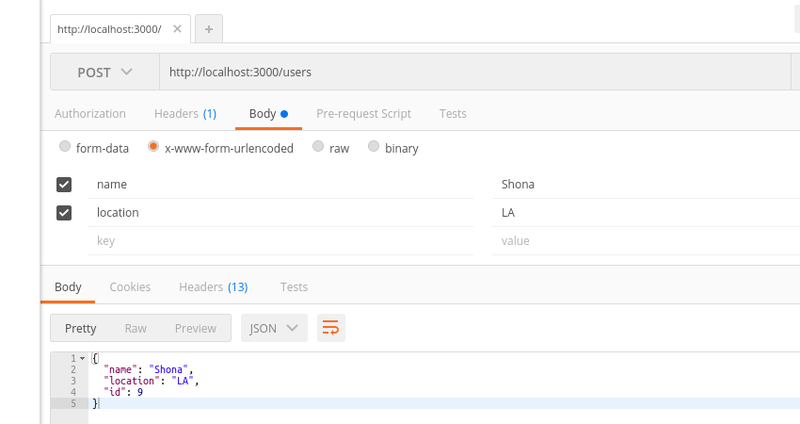 REST APIs form the back end for mobile and web applications. When developing applications, sometimes you won't have the REST APIs ready to be used for development purposes. To see the mobile or web app in action, we require a server which throws in some dummy JSON data. That's when the fake REST API comes into the picture. 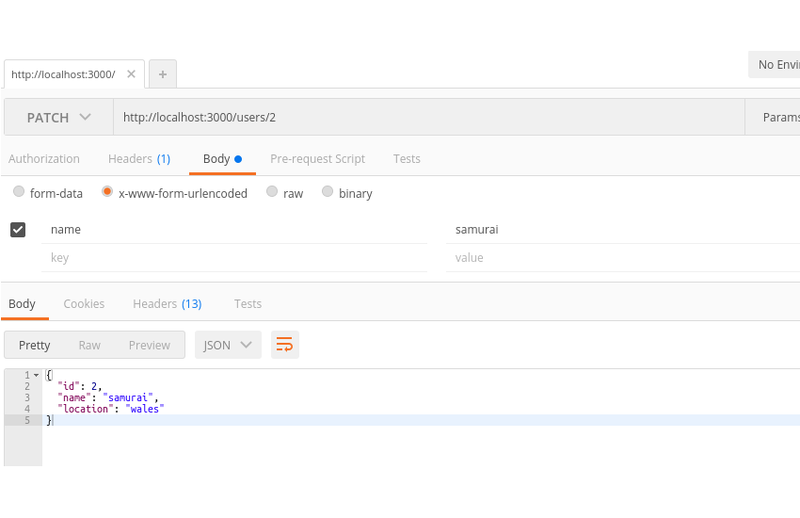 json-server provides the functionality to set up a fake REST API server with minimum effort. To get started with using json-server, install the package using Node Package Manager (npm). From the terminal, run the json server with info.json as data source and you should have the REST API running at http://localhost:3000. 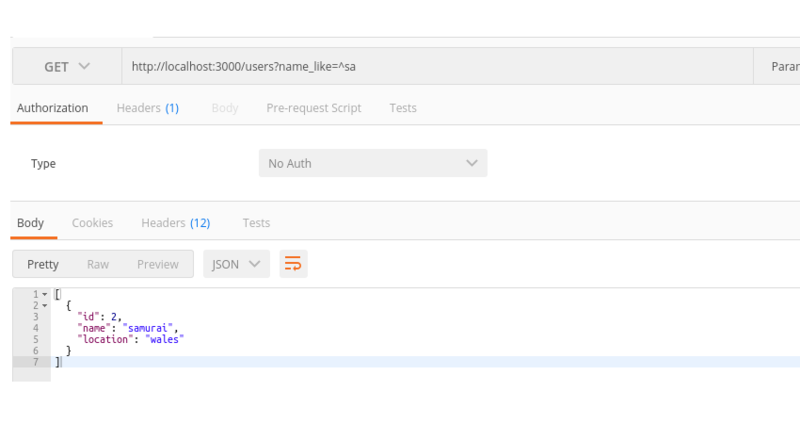 Since our fake REST API server is up and running, let's see how to access the REST API using a client. 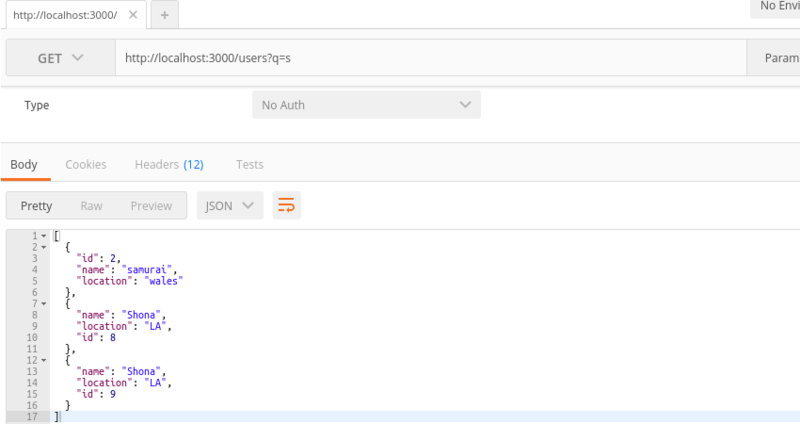 I'm using Postman REST client to make the API calls. Let's start by making a GET request to the REST URL. Inside the json file, we have defined an endpoint users which contains information related to users. On making a GET request to the URL http://localhost:3000/users, it should display the existing data. Try doing a GET request and you should have the newly added data in the info.json file. 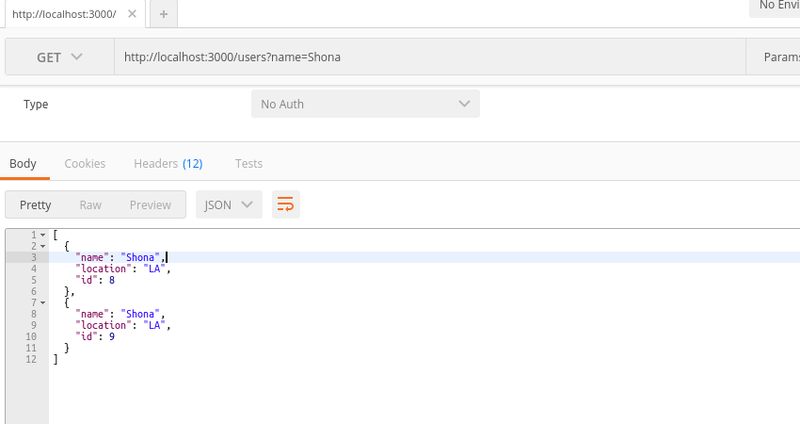 To delete an entry from the json-server data, you need to send a DELETE request to the API endpoint with the user Id. For example, to delete the user with Id 1, you need to send a DELETE request to the endpoint http://localhost:3000/users/1. Once it's deleted, try doing a GET request, and the user with Id 1 should not be in the returned JSON. As seen in the above image, sending a GET request to the URL http://localhost:3000/users?name=Shona would return the users with name Shona. Similarly, to search for users with any other fields, you need to add that field to the query string. While displaying a paginated data grid, it would be required to fetch some data based on pagination. In such scenarios, json-server provides the functionality to paginate the JSON data. By default, the count of data returned from json-server is 10. We can explicitly define this limit using the _limit parameter. A GET request to the above URL would return five records. Now, to paginate the data, we need to add another parameter _page to the URL. _page defines the page which needs to be fetched on returning the data. A GET request to the above URL would return the second page of the data set with five records per page. By changing the _page variable, we can fetch the required page records. The above URL would sort the data based on the column Id, and it would be sorted in descending order. 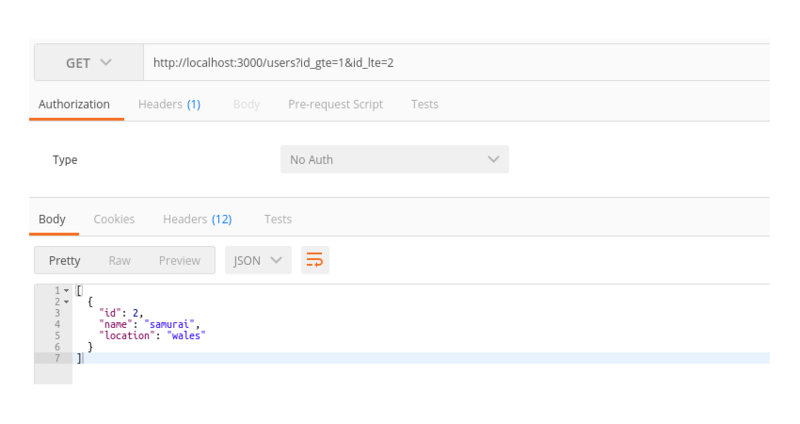 json-server also provides the functionality to support operators like finding an entry with Id in range between two values or an entry matching a particular regular expression. If we want to search for names starting with a certain letter, we can use regular expressions. For example, to search for names starting with letters sa, we'll make use of the _like operator and make a GET request to the URL http://localhost:3000/users?name_like=^sa. In this tutorial, you saw how to use json-server REST APIs to create a dummy database for quick use. You learnt how to get started with using json-server and query the URL to add, update, modify and delete data. You saw how to paginate, sort and search the dummy data. You also saw how to use operators to search for entries using regular expressions. Have you used json-server or any other fake REST API server for dummy data creation? How was your experience? Do let us know your thoughts in the comments below.